JEDDAH: Approximately 19,000 British pilgrims are in the Kingdom to perform Haj this year. The pilgrims have come through 94 UK-based Haj operators which are licensed by Saudi Arabia’s Ministry of Haj and Umrah. The British Haj Mission met with British Consul General Barrie Peach in Jeddah on Thursday and discussed support available to British nationals during Haj. 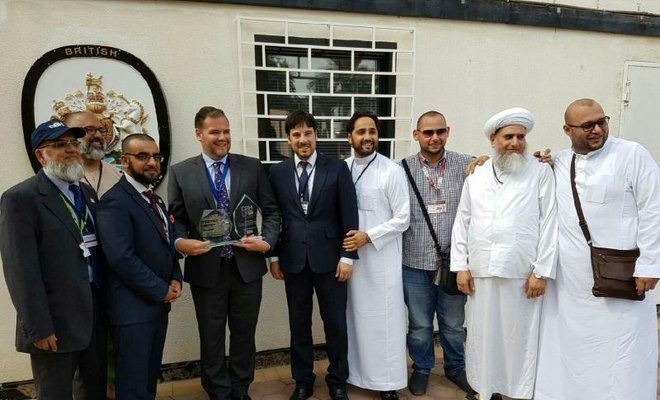 The mission is being led by the Islamic Cultural Center (ICC) with volunteers from the Council of British Hajis (CBHUK) and the British Haj Medical Team. Saudi Ambassador to the UK Prince Mohammed bin Nawaf is a trustee of the ICC in London. On behalf of ICC Director General Dr. Ahmad Al-Dubayan, Zuberi extended warmest regards to the British consul general and reaffirmed the commitment to serve and support British pilgrims during Haj. “We continue to work closely with the Saudi Embassy in London and it is very important that we strengthen our relationship with the British Consulate in Jeddah and partners to ensure the highest standard of service for British pilgrims,” said Zuberi. Consul General Barrie Peach promised full support to the pilgrims. Dr. Mohammed Jiva from the British Haj Medical Team said British doctors would be available during Haj to treat pilgrims. “Having British doctors on hand, who are familiar with the NHS system in the UK, will make follow-up easier for the pilgrims on their return,” he said. The British Haj Mission will operate until Sept. 19.